The Tithe Maps were drawn as a result of the Tithe Commutation Act of 1836 which demanded that payments of tithes be in money rather than farm produce. 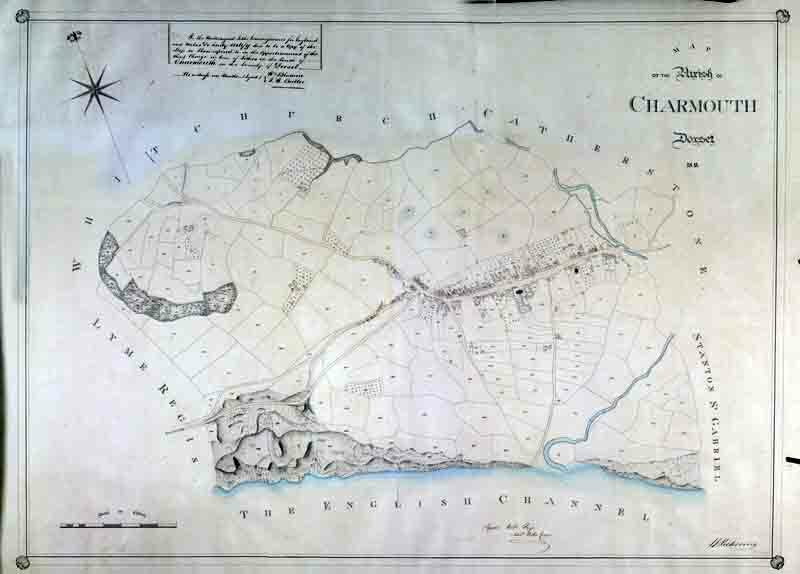 A complete census of land use was prepared by surveyors covering both agricultural and built-up areas, so that the parish was divided up into a mosaic of homogenous parcels of land, such as fields, plots of woodland or areas of farm buildings in the rural parts of the parish and dwellings, places of worship and industrial buildings in the built-up parts. Each parcel of land was given a unique identifier. Inhabited buildings are shaded pink, other buildings are shaded grey. Note: the map is not aligned north-south – see the north arrow in the top-left (NW) corner – the map is aligned about 20degrees east of north (presumably to save space and fit the map neatly into a rectangle). Photographic image produced by Dorset History Centre. The centre of the village is somewhat out of focus (see the village tithe map for a clearer map of the village centre).